With a formal education in understanding important marriage rituals and traditions, Ananth Ramu from Bangalore is the best purohit in the city. He has a deep knowledge of Yajurveda Mula and Alankara Vidvat and can perform any type of pooja. He also has eight other pundits, who will ensure that every ritual is performed just the way it's supposed to. 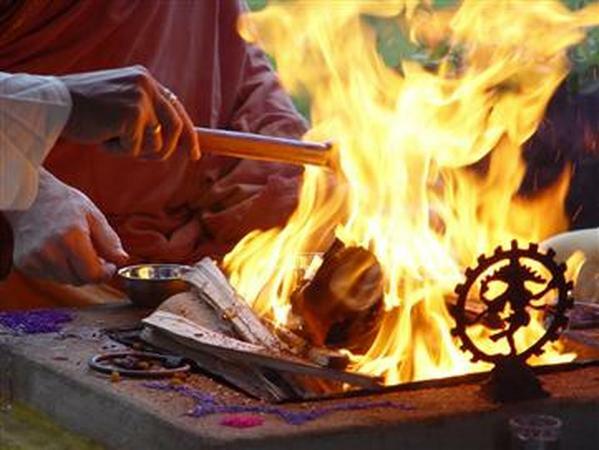 When the group chants mantra or shloka in sync, their voice automatically creates a spiritual atmosphere during the ceremony. Mysore Bank Colony Bus Stop, 80 Feet Road, Srinivasa Nagar, Banashankari, Bangalore, Karnataka- 560050, India. Ananth Ramu is a pandit wedding based out of Bangalore . Ananth Ramu's telephone number is 76-66-77-88-99, address is Mysore Bank Colony Bus Stop, 80 Feet Road, Srinivasa Nagar, Banashankari, Bangalore, Karnataka- 560050, India..
Ananth Ramu is mainly known for Wedding Pandit, Priest, Marriage Pandits. In terms of pricing Ananth Ramu offers various packages starting at Rs 10000/-. There are 0 albums here at Weddingz -- suggest you have a look. Call weddingz.in to book Ananth Ramu at guaranteed prices and with peace of mind.